Things have been a little hectic here, so the garden hasn’t been getting that much attention other than automated watering. 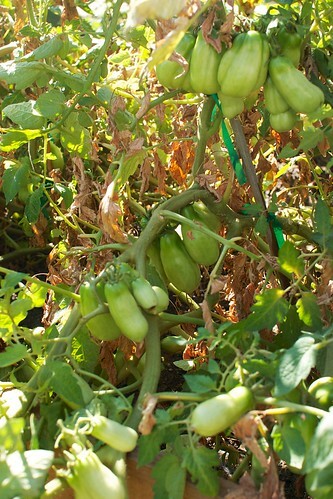 I walked outside today to check the damage and was met with lots of overgrown tomato plants. When these seedlings were first put in, I was hoping they would become giant and bountiful like the pictures I see in magazines. I think they’re getting there. Lots of tomatoes, but not many that are red yet. 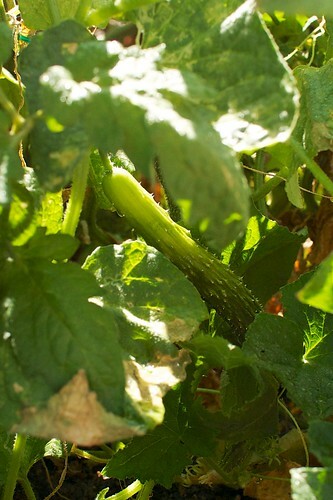 The Japanese cucumbers seem to finally be taking off while our zucchini plant is tapering down. 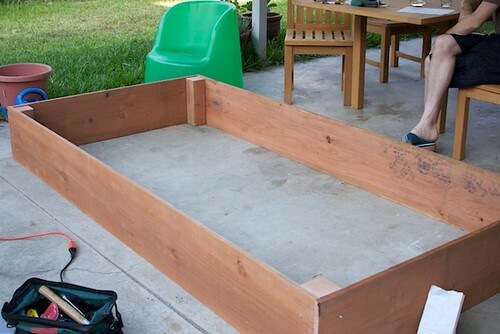 A weekend project I’ve been meaning to undertake was to create a raised garden for extra vegetable growing space. Right now, our backyard has a medium piece of lawn, which I hate because it uses up water and I can’t eat it. 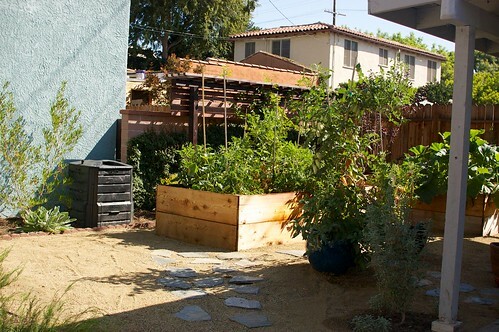 The solution: put in a 4’x8′ raised bed for planting vegetables in. Will and I went to Eagle Rock Lumber & Hardware, one of the few lumberyards open on a Sunday and they couldn’t be nicer. The guy working at the lumber department knew exactly what I needed and cut all my pieces to size and even threw up two scrap pieces to use as stakes for the long sides of the bed. We used untreated redwood. Then we stopped by the San Gabriel Nursery (which I highly recommend) to get some soil, compost, and vegetables. 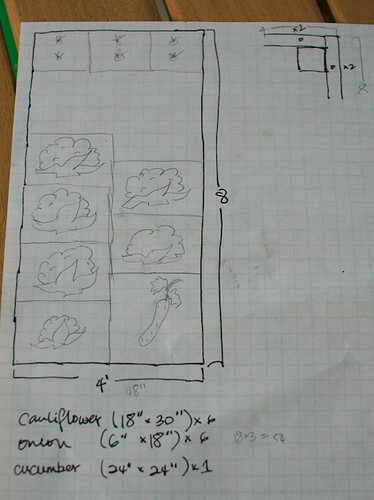 I drew out a handy little diagram to help in planning. First, we had to build the bed, which probably took the longest time. Just four sides secured to four posts. Then, we put in one layer of cardboard and hosed it enough to be soggy. 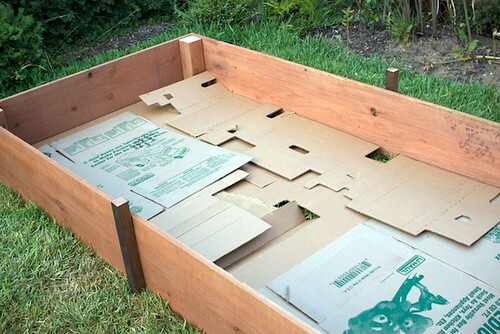 This is one step I learned while looking up lasagna gardening. 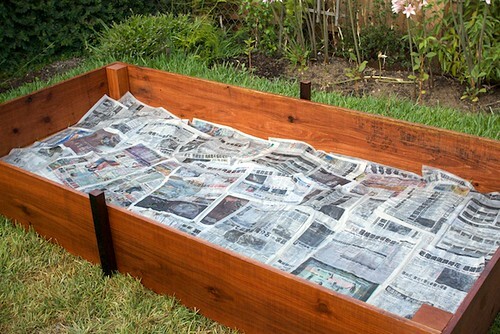 Then, a layer of newspaper, also hosed down to be soggy. These two layers of paper should help in killing the grass under as well as compost and become nutrient for the soil. Then, a layer of dried leaves that were raked last week. Finally, the soil. The people at the nursery recommended us using this potting soil. I guess we got too little of it because it didn’t exactly go as high as I planned. I’ll need to pick up 4 more bags tomorrow. 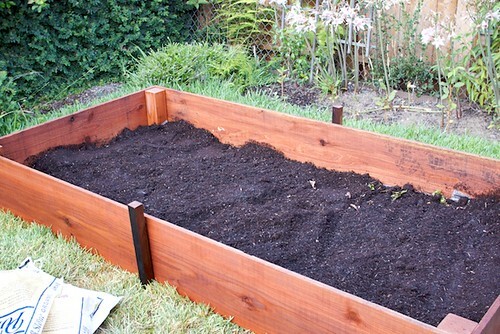 The last step (not shown because we didn’t complete it yet) is to put in a layer of compost. After that, it’s only a matter of putting the plants in, watering them, and hopefully, watching them thrive. Dinner tonight was simple and came from my garden. San Marzano tomatoes tossed in warm olive oil infused with garlic and some chopped basil. 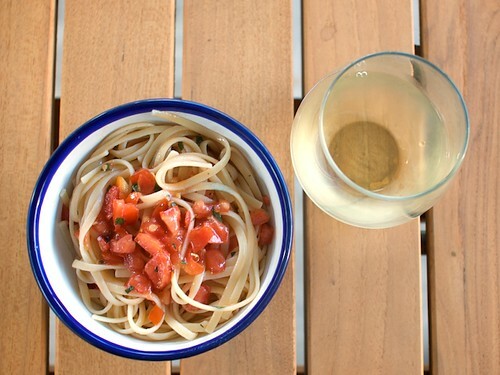 The tomatoes and basil were the fruits of my labor. Well, the basil was almost half-dead, but it still tasted fine! We’ve been in a race against some sort of garden critter with who can get to the ripe tomatoes first. I always lose because I think, “This tomatoes needs one more day on the vine,” but the next day, it’s 1/3 eaten. The critter should be appreciative enough to eat the whole thing instead of wasting it!